To the average Kentucky citizen, the term law enforcement officer evokes visions of police in patrol cars making traffic stops or arresting the bad guys. Some may think of a detective digging to find facts. For a large portion of residents, they give little thought to those pockets of specialized agencies – small in nature – whose certified officers focus on small niche areas that many larger agencies do not deal with on a regular basis. Sitting at a conference table looking out of the window at Kentucky Lake at Kentucky Dam Village (KDV) State Resort Park, Kentucky Park Ranger Sgt. Randy Moore leaned back in his chair and grinned. His reasons are many. A park ranger for more than 11 years, Moore, who has 21 years in law enforcement, said being a park ranger presents many unique challenges as well as rewards. Kentucky Dam Village is one of 49 state parks of varying sizes. According to Park Rangers Col. Dallas Luttrell, not every state park has a ranger assigned, “However, every resort park has at least one ranger and most have two,” he said. 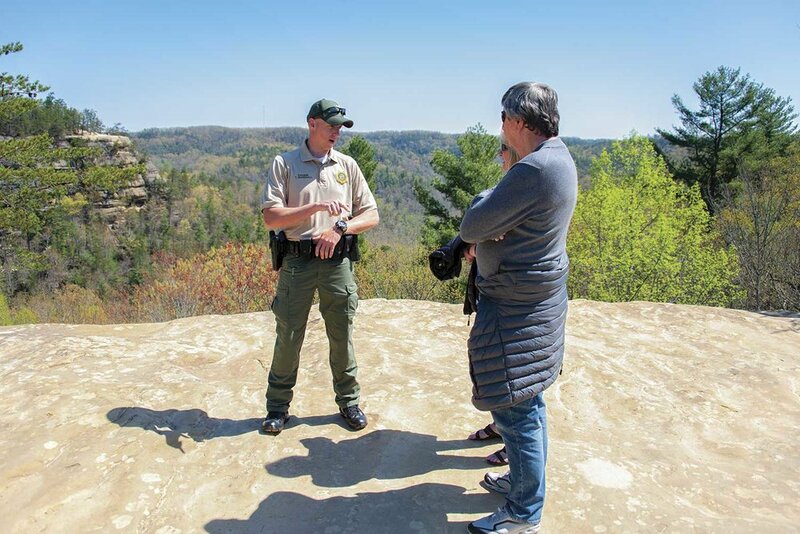 In all, the park rangers are made up of 52 sworn law enforcement officers who provide coverage for the different state parks throughout the state. These parks stretch from Columbus-Belmont State Park in Hickman County to Breaks Interstate Park in Pike County that borders Dickenson County, Va.
At any given day, Kentucky State Parks can have tens of thousands of people visiting them, many of whom are out-of-state tourists. Some parks, like KDV, features lakes for fishing, boating and other water activities. Other parks like Natural Bridge State Resort Park, located in Powell, Lee and Wolfe counties, offers top-notch trail activities, which present its own unique challenges, according to Park Ranger Tim Marshall. The population changes from day-to-day, Moore said, and the perception is crimes spike when the people flock to the parks. But at KDV, it simply isn’t the case. The resort parks being a hodgepodge of patrons, and, of course, oftentimes, the spirits are flowing, Marshall said, which can create alcohol-related issues. Most of the patrons are simply people wanting to enjoy themselves, and park rangers must know when to be heavy- and light-handed, Moore added. Like other law enforcement agencies, park rangers also wrestle with the drug scourge. But for the most part, it isn’t a pressing matter, but it does come up from time-to-time, Moore said. “I have found that if you stay visible, pay attention and deal with the first sign of that type of activity, those folks move on to other places,” he said, adding most of the activity is on the two major roadways (U.S. 641 and U.S. 62) which run through the park. In heavily wooded areas such as Natural Bridge, park rangers are always on the lookout for marijuana growing in the woods, Marshall said. It’s no secret that in order to perform at a high level, law enforcement officers must be in great physical shape. This is especially true for park rangers, Marshall said. Another reason to be in good physical condition is a ranger never knows what awaits them, Moore said. Being a park ranger requires two particular skill sets, Moore said. The first, of course, is law enforcement. Rangers enforce all of Kentucky’s laws. The second is a knowledge of the great outdoors. “What I like is for (rangers) to have a basic knowledge of wildlife and a basic knowledge of what is poisonous and what is not,” Moore said. That’s because a high percentage of the job is fielding questions from people visiting the state park system. A unique aspect of being a park ranger is dealing with wildlife, especially snakes. While park rangers are not certified in venomous-snake handling, it is often a necessary part of the job. Natural Bridge is also home to more than 22 miles of trails, Marshall said. That means during the course of a park rangers day, at some point, he will be on a trail, and his motto is be prepared. Other wildlife also abound throughout the state park system, Moore said, and poaching can be a problem. Kentucky Dam Village has a little of everything. Part of the job is handling wildlife issues, and one of the keys is developing relationships with the Kentucky Department of Fish and Wildlife Resources conservation officers. Given the nature of the job, both park rangers say developing solid relationships with surrounding agencies is a must. In Marshall’s case, trail rescues are inevitable, and when that time comes, the relationships he has developed with nearby public safety agencies is invaluable. Whether it’s dealing with rowdy visitors who have a bit too much to drink, handling other law enforcement-related issues such as thefts and vehicle crashes, or removing snakes and other wildlife from public areas, Moore said at the end of the day one look at a family having a good time is reward enough. Lexington is home to a nine-person law enforcement unit that can pull over a traffic violator on horseback just as easily as pulling the person over in a cruiser. Known as troopers, the Kentucky Horse Park Police Department (KHPPD) staff takes great pride in securing the 1,200-acre park on a 24/7 basis, Capt. Lisa Rakes said. After retiring from the Lexington Police Department’s mounted unit in 2013, Rakes kept her police career going by joining KHPPD. The thing that sets KHPPD apart from other law enforcement agencies is simple, Rakes said. Based on her experience, Rakes said officers on horseback are better received than those working out of a cruiser, and it’s all because of the horse. Horse park troopers handle a variety of calls, and Rakes said many of the calls are non-traditional. 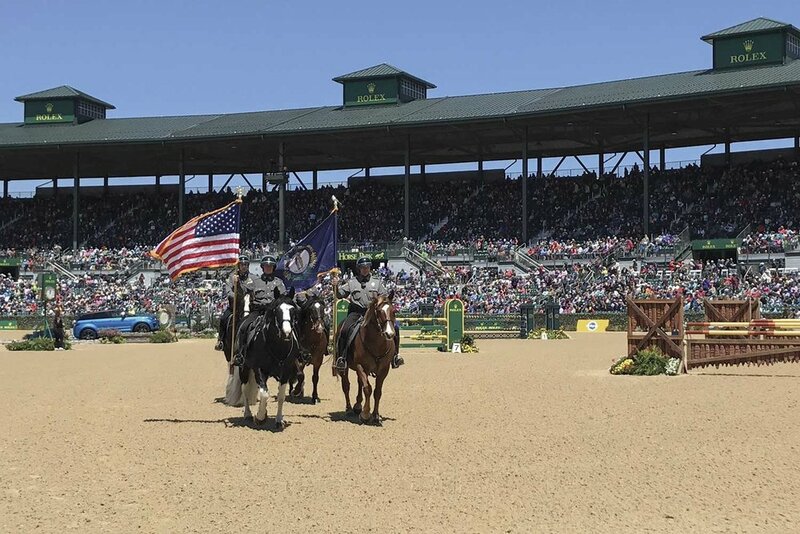 The horse park is home to more than 260 equine and non-equine events every year, according to the 2016-2017 Kentucky Horse Park Annual Report. In all, some 800,000 people visit the horse park from across the United States every year. That equates to a busy police force, Rakes said. In 2017, horse park troopers received 4,389 calls for service; issued 412 citations; performed 349.5 hours of traffic control and had 1,300 hours of horse patrol, according to Rakes. There is very little down time, Rakes said, as weekend events can bring upwards of 5,000 to 6,000 visitors. It’s just as busy during the weekdays with a variety of horse shows taking place at the park. “The weekends is when we have three to five things going on at the same time,” Rakes said. With the busy year-round schedule, it can get hectic for such a small agency, but Rakes said one of the keys for troopers to get through the craziness is simply the horse itself. Some shows bring in 1,000 or more horses, Rakes said. With the large number of people, it makes a nice target for would-be thieves, and the troopers have to be on their collective toes. A lot of what they see is the smash and grab thefts. Horse park troopers are no strangers to dealing with domestic disputes, especially when camping season hits. Because of the nature of what horse park troopers deal with, Rakes said the department typically seeks law enforcement professionals with experience. The horse park isn’t a place where officer will field the same types of calls as their city or county counterparts, Rakes added. A fundamental knowledge of horses is nice, but Sgt. David Johnson said officers who might not be equine experts can also do the job. If an officer doesn’t know a single thing about horses, Rakes said after four months of training, he or she will be able to perform their job well from the animal. Aside from learning to ride, picking a horse to do police work is equally important. Typically, a draft cross horse is the best bet, Rakes added. Draft crosses tend to be more docile, which is a wonderful trait to have in a police horse. These types of horses are effective for crowd control, partly because of the sheer size of the animal. When a trooper is mounted on the horse, he or she has an overall height of roughly 9 feet, giving them the ability to see over crowds and spot potential problems. The highly-visible officer presence can make unruly elements in a crowd think twice before creating a problem. If a disturbance does occur, mounted officers can quickly disperse an unruly crowd, most of the time without ever having to make contact with the persons being moved. The animal’s burley size tends to disarm situations without putting the trooper in harm’s way, Johnson said. When it is all said and done, law enforcement is a major function of the Kentucky Horse Park Police Department and horses are a key element. If tickets are issued, more often than not, the person receiving the ticket has a great story to tell, Johnson said. It makes for a great story, Johnson added. That is one of the benefits of being on a horse. It tends to defuse the situation. Had the officer been in a regular patrol car, the exchange wouldn’t have been as pleasant.